“[The Scientist who has lived by his faith in the power of reason] has scaled the mountains of ignorance; he is about to conquer the highest peak; as he pulls himself over the final rock, he is greeted by a band of theologians who have been sitting there for centuries. – Jastrow, Robert, Astronomy Fundamentals and Frontiers, 1977. Let’s start with the transcendent cause argument for the existence of God. If we combine this statement “it is reasonable the universe has a beginning” with the metaphysical premise that “from nothing, only nothing comes,” then it is reasonable to say that the universe came from something which is not in our realm of physical reality. This “thing” outside our reality is God. In this argument, all we need to do is prove that the universe had a beginning and was not eternal to prove that God exists. We will start this argument with the Big Bang Theory. In the standard model of the Big Bang Theory, space is described by Einstein’s theory of General Relativity. According to Einstein, space is four dimensions: three space dimensions and one time dimension. Space acts like a elastic ballon, which can stretch, warp, and vibrate. The big bang theory is that all the matter in the universe began very close together like an unblown ballon. Then the universe (or ballon) was blown up. As the universe blows up, all the galaxies all move away from one another because the space is expanding. Now it is true that stars, planets, and galaxies all move on their own through space, but this is relatively a small amount compared to the amount of movement due to the universe expanding as a whole. Also note that this is an ongoing process. The universe has been expanding for billions of years and is still continuing the do so today. From physics, we can measure the rate that the universe has been expanding which leads us to conclude that the universe began 13.7 billion years ago with a “bang” or a beginning. Now over time, there have been several modifications to the big bang theory. One modification is the theory that in the first moments of the big bang, there was a rapid rate of expansion, in which the universe went a sudden huge increase in size. This is called the “Planck or inflationary era” which is 10-43 seconds. After this era, the universe expanded at a standard normal rate. The physics during the Planck era are not well understood and cannot be calculated. However, there is “superstring theory” which combines gravity with quantum mechanics and somewhat helps explain this era. One reason to support the Planck era was the discovery of dark matter in 1933. 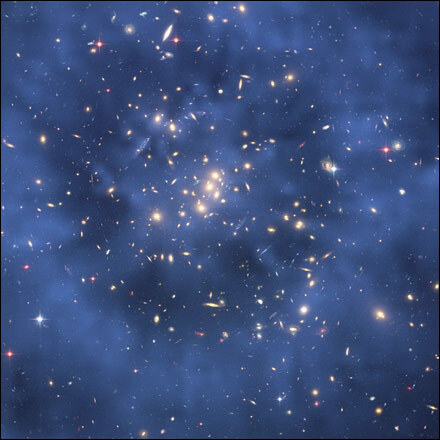 Dark matter is particles that do not emit or absorb light and makes up a quarter of the mass of the universe. In 1998, there was also the discovery of dark energy, which gravitates differently from ordinary matter. Both dark matter and dark energy support the theory of the Planck era.